Is this the GOP nominee? Don't bet on it. You knew it was coming at some point before actual voters put paid to it. 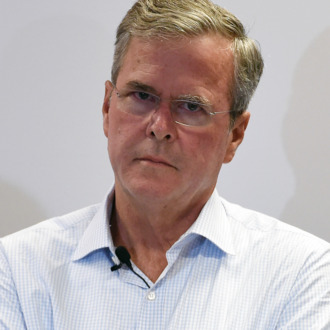 But a “Jeb Bush comeback” narrative arrived ahead of schedule today with a Michael Brendan Dougherty column at The Week making the case that the former Florida governor is positioned to take a big leap from the political intensive care unit to the GOP presidential nomination. Dougherty’s case boils down to three points: First, Marco Rubio ain’t exactly setting the world on fire as the presumed successor to Jeb as the Establishment Republican favorite. Second, Jeb’s super-pac has an awful lot of money. And third, John McCain pulled off this sort of comeback in 2008. Unfortunately for Jeb, all three arguments are shaky at best. Yes, Marco Rubio seems "stuck" in the low teens in most national polls, and he’s in the middle of the pack in both Iowa and New Hampshire. But that seems more of an invitation to Chris Christie and John Kasich and perhaps even Ted Cruz than to Jeb, if you look at polling internals rather than just the horse-race numbers. In the latest national poll, from CNN/ORC, Rubio’s favorable/unfavorable ratio among registered Republicans is 73/15. Bush’s is 42/54. It is extremely unlikely that the poor opinion Republicans have of Jeb is based on a lack of familiarity. So improving that reputation significantly and quickly will be an uphill struggle. And yes, the Right to Rise super-pac still has a large cash balance, though we don’t know exactly how much given the very limited reporting requirement for super-pacs. What we do know is Right to Rise has spent approximately $39 million, mostly on positive ads touting its hero’s Florida record and current agenda. Jeb’s poll standings have actually deteriorated as these ads have run. Why would we assume the next $39 million will be more effective than the first? Yes, there has been talk about Right to Rise going medieval on other candidates — perhaps just Rubio, perhaps just Trump, perhaps everybody other than Trump. But negative advertising is far more effective in winning a one-on-one competition than in creating one; most of the scenarios discussed as options for Team Bush would run a high risk of accidentally elevating some other candidate, which may be why Right to Rise hasn’t (so far) pursued them. But that leads to the strategic quandaries that distinguish Bush ‘16 from McCain ‘08. For one thing, the McCain problem that required a comeback was over-spending, not a basic lack of popularity. For another, there’s a reason McCain’s 2008 miracle is discussed so much: It was a miracle, involving a candidate demolition derby that McCain luckily negotiated like Mr. Magoo. Yes, it’s always possible that Bush could benefit from Trump and Rubio and Cruz and Christie and Kasich all taking each other down several notches, but Jeb’s not a sure thing to beat Carly Fiorina with his current levels of popularity. The odds of him boosting his numbers by 600 percent or 700 percent (what he’d need to become genuinely competitive) as everyone else declines are not very good, and seem to become vanishingly small if you remember how Bush got into this situation in the first place. Jeb apparently calculated that a few positions that weren’t terribly popular with the GOP’s conservative base wouldn’t hurt him in a nomination contest, and might even give him some electability points. He picked the worst year in living memory to accentuate his independence on hot-button right-wing issues, and to make his success as governor of Florida some time ago his calling card, along with a last name that connotes “betrayal” to conservative activists. If he now executes a comeback, it will be in defiance of just about everything we’ve learned during the invisible primary. Dougherty calls Jeb Bush a "value bet" because he’s been so regularly written off. But sometimes betting on an extremely disappointing "team" is a mistake at any odds because it’s a matter of throwing good money after bad, as Right to Rise may be in the process of doing. Yes, a poor start is always prelude to a big comeback — but it hardly guarantees it. A poor finish for Jeb Bush remains a better bet.